I tend to shy away from plugging products from bigger companies, but on occasion stumble across something that is genuinely worth shouting about regardless of who is producing it, and Three’s Mifi is one of those very occasions! The cute yet powerful Mifi is a mobile broadband ‘mini router’ that allows you to connect up to 5 wifi devices (laptop, mobile, iPad, gaming devices etc.) to the internet at any time, and more importantly, anywhere. Since Three introduced the UK’s first Mobile WiFi (MiFi) device a couple of years ago, it’s been one of their most popular products, unsurprisingly so – their standard phone network reported to be pitifully poor in many areas since they dropped their 2G network. It is remarkably easy to use and you can connect any WiFi device, and up to 5 of them at any time. I have the second generation version, which I love (it’s like a little box of magic!) but Three are already about to launch the next generation, the UK’s only one to feature the latest HSPA+ technology for faster downloads. This new device is reported to have significantly increased speeds, improved ease of use and a handy charging cradle (the biggest improvement for me, as it enables Mifi to be used more easily as an alternative to fixed line broadband). The newly increased speeds are up to 40% faster than they were before, and it’ll only get faster as Three continue to upgrade their 3G network during the rest of the year. I’ve done a fair bit of research into mobile broadband over the last few months, as I am planning on living on a narrowboat in the near future, and Three have been far and away the leader in supplying this kind of gadget up now, although T-Mobile’s new Wireless Pointer is now stiff competition, as it not only does the same job, and can be purchased unlocked, but has the added advantage of a socket for using an external antenna, something worth considering if planning on using inside a car or boat (where the surrounding metal can heavily affect the signal). The Three network itself can be a little hit and miss as mentioned, even their 3G signal, so its worth investigating the signal strength in the main areas you will using your Mifi before buying one, or at least buy an unlocked one which can be used with a mobile broadband SIM card from any provider; you should also take a look on Ebay, as it possible to buy various Mifi gadgets that are unlocked so can be used on certain other networks. An important note: don’t confuse a phone sim card which includes mobile internet with a mobile broadband sim card, they can be distinctly different on some networks and only the latter will work in a Mifi (although I did find that a standard Orange SIM did work in the Mifi despite Orange’s insistance that it wouldn’t; data allowance isn’t great though so this wouldn’t be an ideal solution). 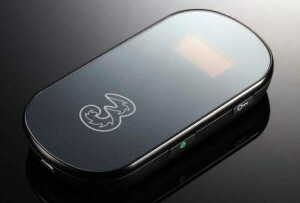 Buy an unlocked Three Mifi here.